We could not add this in this release because we are working on a better way of adding files (one at a time as we scan) on load that would eliminate the need for that. Please wait for the next version. Didn't know that so it is possible. and few other people. CPM run uninstaller but didn't delete monitored entries. This is the message shown when you uninstall a 'not monitored' application and you cancel the standard uninstall or it fails to complete. CPM detects the abnormal behavior, informs the user about this and asks if you simply want to remove the application from the ADD/Remove Programs' registry so it won't be shown in the list anymore. I'm just here to say that as a new user of CPM, I'd wondered about the utility of the thing, seeing how it sits quietly and afaict wasn't doing much of anything. Then I had to uninstall a program, and responding too quickly to the "restart your computer NOW?" dialog I noticed there was still a directory left-over, and files, and I wondered what else. 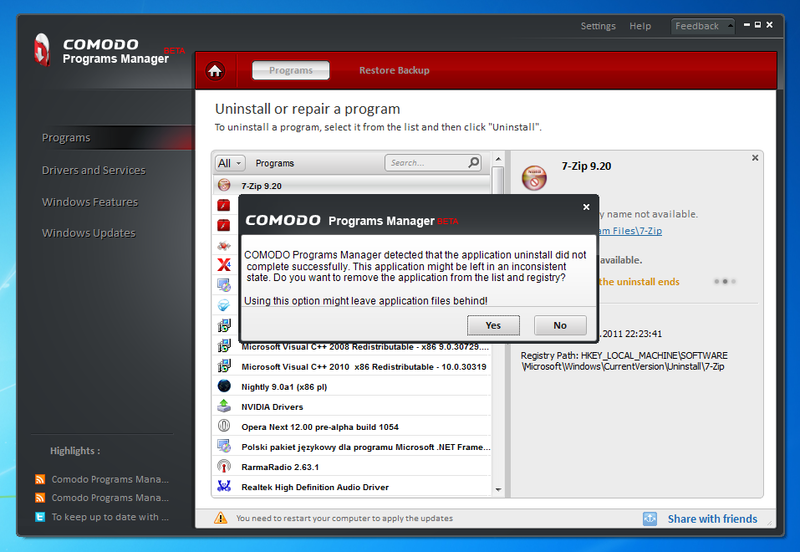 Well, looking at the Programs list I found Comodo still showed that the uninstall hadn't completed yet, and I ran the Uninstall in CPM and it got rid of those dirs plus a bunch of leftover registry keys. All of which I'm sure the program would not have uninstalled on its own. Anyway I've used it again with another program, and again it removed dirs/files/keys that the program's own uninstaller would have left behind I'm sure. So far I like CPM a lot, thanks! When it asks you to reboot, simply answer No and finish the procedure with CPM. Same as Revo Uninstaller.... When it asks you to reboot, simply answer No and finish the procedure with CPM. Don't know Revo but yes, I know now to always answer No to "reboot now?". Takes a long time, and you'd better not have any programs making system or registry changes or this utility will deep-six those when uninstalling again the program it monitored here. I'd really love to see an explanation of how CPM monitors an installation. I'd also like to see a CPM feature (future enhancement?) which would show you exactly what changes the app made to your HDD. Hmmm I just went to look at the uninstall log and it's gone. At least, I know I've seen it before but I can't find it now. Shouldn't it be in the program dir along with AppInfoLog.txt? You could answer 'yes' as well, the application will appear as 'partially uninstalled' next time you open CPM. I'd really love to see an explanation of how CPM monitors an installation. Maybe you can find this post useful. I'd also like to see a CPM feature (future enhancement?) which would show you exactly what changes the app made to your HDD. The enhancement will be added in the future releases. Until then, you can make a workaround by checking the 'Force Uninstall' option from the 'Settings' tab. This will skip the build-in uninstaller and the files and registry that are for removal will be shown to the user. You can then 'Cancel ' the uninstall operation. I'd seen that AA but it doesn't explain how CPM knows what registry changes are being made for example. Oh well, I don't really need to know how CPM performs its magic I guess, so long as it works! Excellent, I will take a look!